Benincasa peel (Dongguapi)-Benincasa hispida (Thunb.) Cogn. Botanical Name: Benincasa hispida (Thunb.) Cogn. 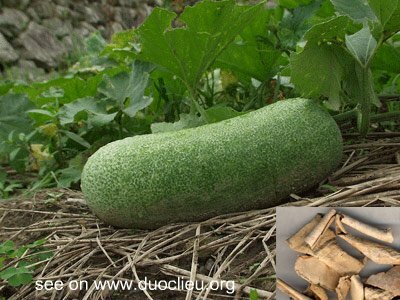 Part Used & Method for Pharmaceutical Preparations: The peel of the gourd is dried in the sun. Properties & Taste: Sweet and slightly cold. Meridians: Lung and small intestine. Indications & Combinations: Edema. Benincasa peel (Dongguapi) is used with Phaseolus seed (Chixiaodou), Imperata rhizome (Baimaogen) and Poria (Fuling) in the formula Donggua Wan. The Benincasa seed (Dongguaren), or Chinese wax gourd seed, is sweet and cold in properties, and clears heat in the lungs, resolves phlegm and eliminates pus. The herb is indicated in cough due to heat in the lungs, lung abscess and intestinal abscess. The dosage is 10-15 g.